I'm the first to admit that there are days when a mixed lighting scene would not be my first choice. But I don't feel that way all of the time. And in fact, there are instances when I capture something that I truly like using a couple different light sources, such as this portrait of Kathryn. Portrait by Derrick Story. Canon 5D Mark II, Canon 70-200mm f/2.8 zoom at 130mm f/3.5, ISO 1600, 1/400th, +2/3 exposure compensation. 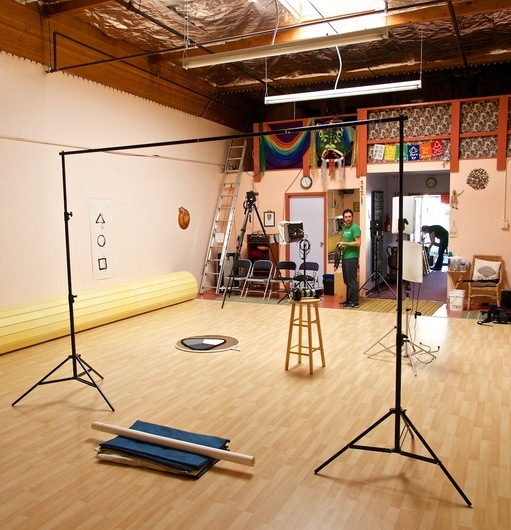 The location for the shoot was a yoga studio that had a large skylight overhead. I had packed my usual gear including backdrops, strobes, and Lowel Ego Lights, which are 30W compact fluorescent lamps color balanced to 5000 degrees. The light coming in from outside was probably around 5600 degrees, but it was tinted by the walls and flooring of the studio. All in all, it was quite a grabbag of color temperatures. We added to the recipe by using a circular Photoflex MultiDisc Circular Reflector for offside fill light using the silver/gold surface. So how did I bring this all together? Well, first of all, none of the color temperatures were extremely different than my main lights, which were stacked Lowel Ego Lights. So my range was tolerable from the get go. I used a white/gray/black card for the first few frames to help me fine tune the color, if necessary, in post. As it turned out, the color looked very good on the Canon 5D Mark II LCD, which is important for me during the shoot because I like to show images to the subject to build confidence. But in post, I thought they were a tad too warm, so I did cool them off. It was worth it, however to have that wonderful, natural hair light during the shoot. I think that top light adds much to the composition. And with benefits like that, I'm happy to deal with a mixed light scenario. Nikon Rumors is predicting a Nikon 1 V3 with a new 10-30mm f/3.5-5.6 PD VR lens and a 70-300mm f/4.5-5.6 VR zoom will be announced this week, probably on March 12th or 13th. This could be tempting news for Nikon shooters, with the 3rd generation of the mirrorless line bringing about substantial performance improvements. The Nikon 1 V3 may lure more DSLR shooters into the mirrorless world who had been previously hesitating because they wanted to stay in brand, but weren't impressed with Nikon's offering. As for the rest of us... a new camera announcement is always fun. The Nikon 1 V3 should have a high Nimbleosity Rating. What does that mean? You can learn about Nimbleosity and more by visiting TheNimblePhotographer.com. Last night, when I downloaded the latest issue of Time Magazine for my iPad mini (March 17, 2014), I had no idea about the treat that was waiting for me. 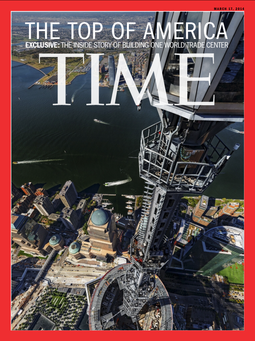 The cover is a 360-degree panorama from the top of the Freedom Tower (The One World Trade Center) in New York. As I tapped and moved my index finger on the cover, I could explore the city below. This is something that could never be done with a paper edition of the publication. I have been a big fan of iPad-compatibile publishing for some time now. I subscribe to Time, Popular Photography, c't Digital Photography, the San Francisco Chronicle, and others, plus USA Today, which is free. Publishers have continued to improve their offerings, making periodical reading on the iPad more than just convenient... it's compelling. In my mind, this latest issue of Time is a watershed moment. My hope is that people will try these publications and see that the change from paper to digital isn't just an inevitable economic decision, but can actually move the periodical medium forward. As a bonus treat, here's a behind the scenes about making the GigaPan image. The iPad version of Time Magazine has a high Nimbleosity Rating. What does that mean? You can learn about Nimbleosity and more by visiting TheNimblePhotographer.com. 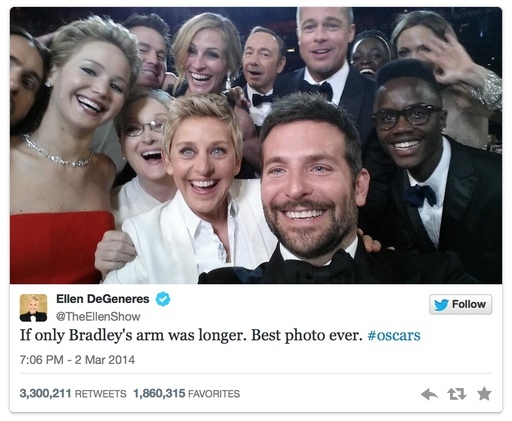 Among the discussion about the famous Ellen DeGeneres selfie at the Oscars, one of the talking points should be the great tip she provided for event photographers. Today on The Nimble Photographer Journal, I write about the lesson we can learn from Ellen's brilliant Oscar night performance in the entry titled, The Selfie Seen Round the World. Ellen DeGeneres has a high Nimbleosity Rating. What does that mean? You can learn about Nimbleosity and more by visiting TheNimblePhotographer.com. March must be DSLR lens month. Right now there are great deals on Nikon, Pentax, and Canon glass. Here are a few promotions that I've found interesting. Here's an entire page of AF-S Nikkor glass on sale. 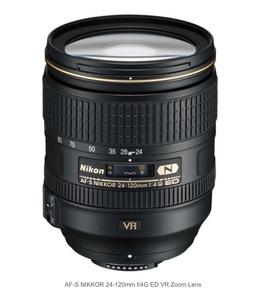 One of my favorites here is the Nikon AF-S NIKKOR 24-120mm f/4G ED VR zoom lens reduced $300 to $996. Promotion ends March 29, 2014. Take a look at this page of Pentax glass on sale and you'll see some terrific deals. My favorite is the Pentax smc Pentax-D FA 100mm f/2.8 WR macro lens that has been reduced $200 to $646. Better hurry on the Pentax deals, however, promotion ends on March 6, 2014. Buy a DSLR and save big on a lens. Take a look as this Canon Sale page. My choice here is the exceptional Canon 70D bundled with EF-S 55-250mm f/4-5.6 IS STM. Essentially, you get the lens for half price ($163) and a good deal on a great camera. The Canon promotion ends March 15, 2014. I recommend that you go with "Instant Savings" deals that apply the discount to purchase. That reduces the charge to your credit card, and there's no fuss. I *don't advise rebate plans* because they are extra work and sometimes only lead to frustration. Avoid rebates. As long as you have spousal approval, you could take advantage of a deal right now, put it on the credit card, and be ready to pay with your tax refund check. If that money has to go elsewhere, it still doesn't cost anything to look and dream. This week on The Digital Story photography podcast: Sigma Takes on Zeiss with its New 50mm f/1.4 Art lens; Apple TV Review; From the Screening Room: Tim Grey: Photoshop CC Raw Workshop; and on the Nimbleosity Report: PhotoSync for iOS and Mac - All of this and more on today's show with Derrick Story. Story #1 - The Weekly Update: Olympus OM-D E-M10 shooting experience and studio tests published (DP Review) "Live Composite, new to the E-M10, captures a series of long exposures, analyzing each frame to keep the brightest pixel in each location and creating a single composite image. In plain terms, it captures light trails without overexposing the rest of the frame, taking the guesswork out of long exposure photography. You get to preview the effect as the exposure builds up on screen and choose when to stop." In other news, Sigma wasn't bluffing: 50mm f/1.4 Art appears to match Zeiss Otus ($3,990) on sharpness, beats it on contrast (Imaging-Resource). And finally, Fujifilm Discontinues Neopan 400 PRESTO 35mm and Fujicolor PRO 400 120 Film (PetaPixel). Now that Apple has declared that Apple TV is no longer a hobby, I thought it might be a good time to check in with the Internet-connected hockey puck. AirPlay Mirroring - I can share just about anything from an iPhone, iPad or current Mac via AirPlay. Great for showing off your pictures or videos to a small audience. Apple Content - Movies, TV shows, music, iTunes Radio, and podcasts are easily accessible. Some Interesting 3rd Party Content - Sky News, YouTube, Vimeo, Flickr, Vevo, HBO Go, Netflix, hulu, PBS,and others round out a variety of content that has something for just about anyone. Remote Control App - Using the iPhone or iPad to enter searches and passwords is much simpler that the Apple TV interface. Bluetooth Keyboard Compatible - You can even connect your Apple wireless keyboard to the Apple TV. No iOS Apps - If apps were enabled, I could do things such as run Olympus Share on the Apple TV and view my photos in HD, streamed directly from the camera. Pesky Subscriptions - I find something interesting to watch, only to learn that I need a cable subscription or that from a particular service in order to view. So that Apple TV channel isn't really a channel, but an advertising tile. Spotty Performance - I have screaming bandwidth at my studio, but many of the 3rd party services are slow to load and often stall while in progress. Bottom Line: I think the Apple TV is a terrific device for $99. I use AirPlay Mirroring often, and I enjoy listening to podcasts and watching movies with the device. But it has a long ways to go, as I'm sure even Apple will admit. iOS apps could open many doors for Apple TV. That is the top request on my list. Story #3 - From the Screening Room - Tim Grey: Photoshop CC Raw Workshop, Image Sharpening. This week's featured artist is Photoshop veteran, Tim Grey. Tim tackles a variety of techniques in this week's featured title, including image sharpening. You can watch Tim in action by visiting the TDS Screening Room at lynda.com/thedigitalstory. While you're there, you can start your 7 day free trial to watch other photography titles, plus every other topic in the library. Story #4 - The Nimbleosity Report - Super handy PhotoSync for iOS and your Mac. Photo Assignment for March 2014 is HDR. Order a SizzlPix! using the image from which you've already made your best print. If, when you receive your SizzlPix!, you don't feel that it's the best version of your image ever, return yours within 30 days for a full refund. Oh, and BTW: SizzlPix! now is qualified for PayPal "Bill Me Later," No payments, No interest for up to 6 months, which means, have your SizzlPix! now, and pay nothing until August! In addition to subscribing in iTunes, you can also download the podcast file here (32 minutes). You can support this podcast by purchasing the TDS iPhone App for only $2.99 from the Apple App Store. SizzlPix! - High resolution output for your photography. You've never seen your imagery look so good. SizzlPix.com. All of the Oscars may have been handed out, but there's still news in the world of cinema. 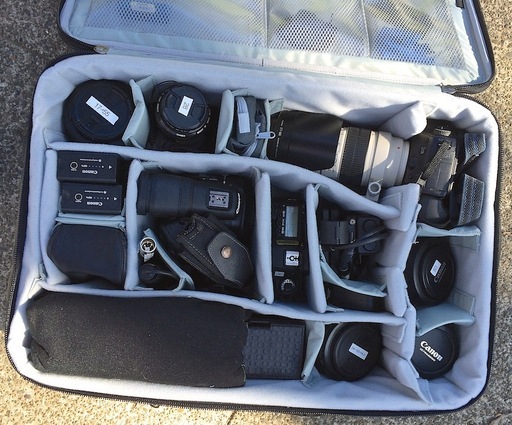 Lowepro just announced a completely redesigned update to their venerable x-Series rollers. And we had a chance to test the Lowepro x300 Pro Roller AW during a week of location shooting with the live action crew from lynda.com. 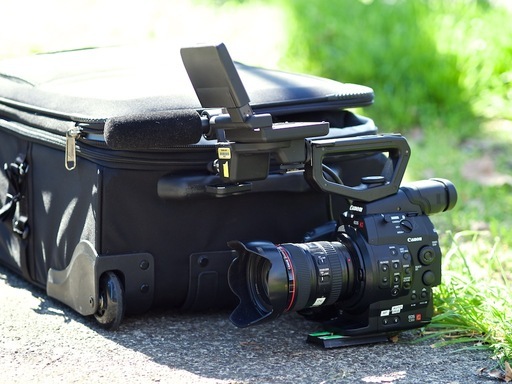 Led by filmmaker Jacob Cunningham and producer Heather Schuler, the crew packed their Canon EOS C300 Cinema Camcorders, Canon optics, DSLR bodies, audio gear, and accessories into the roomy cargo space of the x300 roller. "I can't believe how much gear this roller packs," commented Jacob after day 1. 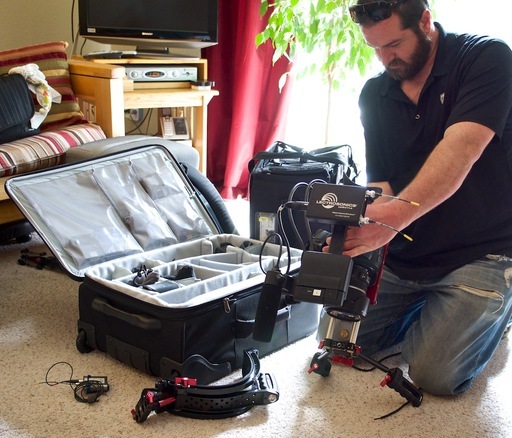 "We replaced three bags with the x300." In addition to its depth and capacity, standout features include: vibration-absorbing, durable wheels with ABEC-5-rated bearings (user replaceable), TSA-approved lock, redesigned MaxFit system that provides maximum protection while taking up less space, sturdy double-rail handle, all weather cover, and removable reserve pack interior. In the field, I noticed that both tripods and light stands were mounted with the redesigned straps on the side of the bag. And because of its sturdy construction, other bags could be strapped to the extended handle and rolled to location. The ballistic nylon hardshell exterior offers durable protection all of the gear inside the zipped-up case. Plus, when you're working on location, there's an easy-access front stretch pocket that accommodates a 17" laptop. The no-drop front organizer pocket can handle those small items that you need to get to quickly while on the go. All three rollers: x100 ($369), x200 ($399) and the x300 ($479) are available at lowepro.com (US addresses only) and at B&H Photo (US and International). For the Jan. 2014 Photo Assignment, TDS shooters explored the absence of color. See for yourself in our gallery, White. And which one will be the SizzlPix Photo Assignment Pick of the Month? "The water fowl go crazy when one of the neighbors breaks out a bucket of food," writes Kevin Miller. "I took images of this feeding earlier this month and did some extended post-processing to bring this image together. 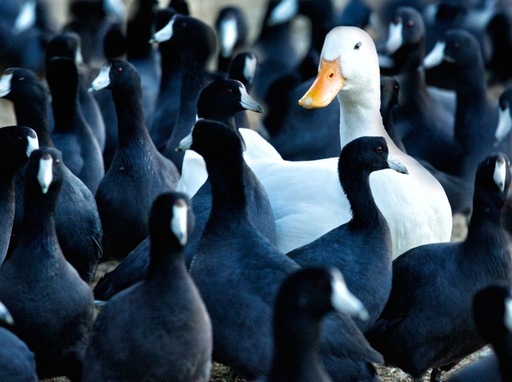 I love the contrast of our white friend amidst all his neighbors. I call this one 'I'm in Charge.' Photo by Kevin Ned Miller. See all of the great images from this month's assignment by visiting the White gallery page. The March 2014 assignment is "HDR." Details can be found on the Member Participation page. Deadline is March 30, 2014. No limit on image size submitted. Please follow the instructions carefully for labeling the subject line of the email for your submission. It's easy to lose these in the pile of mail if not labeled correctly. For example, the subject line for this month's assignment should be: "Photo Assignment: March 2014." Also, if you can, please don't strip out the metadata. And feel free to add any IPTC data you wish (These fields in particular: Caption, Credit, Copyright, Byline), I use that for the caption info. Gallery posting is one month behind the deadline. So I'm posting Jan. 2014 at the end of Feb., the Feb. gallery will be posted at the end of March, and on and on. Good luck with your March assignment, and congratulations to all of the fine contributors for January. If you love mobile photography like I do, then you'll enjoy iPad for Digital Photographers -- now available in print, Kindle, and iBooks versions. 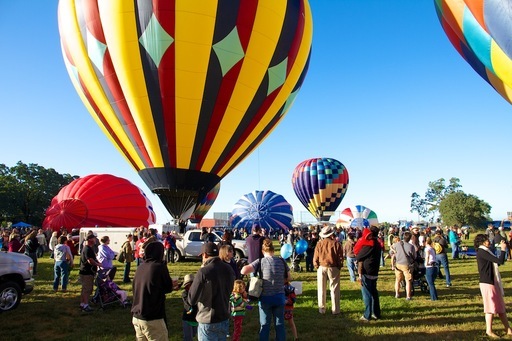 Photography Talk posted a good article titled, How to Photograph Big Events. There are some solid talking points in there worth reviewing if you have a shoot on the horizon. Mirrorless cameras will lighten your load and help you blend in if you're not shooting with a media pass. Be conservative and considerate when considering photographing a child. You may have a momma bear nearby who doesn't appreciate using her cub as a photo subject. I think shoulder bags are better than backpacks for crowded events. Bring your own food and water. You don't want to waste time standing in long concession lines for a greasy burger or to stay hydrated. 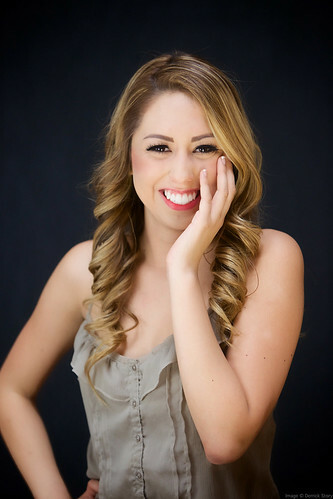 Bring model releases and use them for shots that you think might be valuable up the road. As creative people, we do so many interesting things on our Macs. If you want an easy and affordable way to capture that activity and share it with others, you may want to investigate Screenflick. With this application, I can record any activity on my Mac, both visual and audio, then share it in a variety of formats, including QuickTime movies, Flash f4v, and resolutions tailored specifically for iOS devices. I can record a master movie, then export it in a variety of resolutions for different uses. I can also record time lapse movies, watermark my output, or just capture a portion of the screen. And the best part of all, is that Screenflick renders fast, very fast. So I don't spend a lot of time waiting between recording sessions. I've used Screenflick professionally. But for only $29, I'd buy it for my fun, creative projects too. You can test Screenflick for free. If you have a project in mind, you may want to take a closer look.